Last week, task management platform Producteev launched a new application for iPads and a native Outlook plug-in. The company has recently been acquired by Jive, and we can see that the acquisition did it good. Producteev also launched a new Pro plan for $99 a month, which will get to you premium support for 100 employees, the Outlook plug-in, and custom branding. “There is a big market opportunity with people who use Outlook. They have no choice but to use Outlook, and they want something that goes further when it comes to task management,” said co-founder of Producteev Ilan Abehassera. As far as the Outlook plug-in is concerned, when you install it, it takes over the tasking feature and deals along with all Producteev features in Microsoft Outlook interface. It enables you to add a task like you would regularly do in Producteev, boasting a natural language processing. You can also comment and browse your activity feed and more. The best part about the Outlook plug-in is that everything is immediately synchronized with Producteev you have installed on your Android smartphone or iPhone, Mac and more. The Outlook plug-in, in simple words, is a fully fledged Producteev desktop client for Windows perfectly integrated with Outlook. Users can add tasks to their calendars and reserve time for their completion. 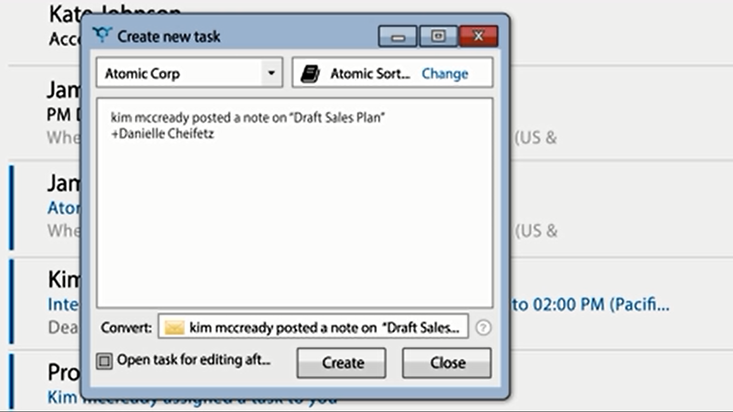 “You can drag-and-drop your tasks to Outlook calendar. We are trying to help our users become more effective,” said the company’s co-founder. Likewise, it will help you transform an email message into a task with just one click. Moreover, you can view the email using other platforms where Microsoft Outlook is not available. “Our Outlook plug-in is low-level engineering. The OffiSync team that was acquired by Jive two years ago worked on it. There are very few teams in the world who can achieve this level of integration,” said Abehassera. As far as the iPad app is concerned, you’ll feel at home if you’re familiar with the iPhone app because the iPad counterpart features the same options, but on a larger screen, making Producteev a truly cross-platform task management tool. Besides the $99 per month Pro plan, the company allows you to subscribe to a limited lifetime plan. In case you do not need technical support, you will be able to get the Outlook plug-in and custom branding for life for a one-time payment of $899. Producteev management is very passionate about the story behind its acquisition. Ever since Jive acquired the company, Producteev has been nothing but a success story. By the time of acquisition, Producteev in itself was already a profitable company with an impressive revenue growth of 10% month over month. It took the developers four years of hard work, but eventually became a fruitful enterprise raising enough money to thrive. In 2012, Jive came along. A few key elements made this acquisition successful. In the first place, all Producteev team moved in with Jive. Producteev was based in New York, but after Jive acquisition everybody moved to Palo Alto. The entire crew kept working on the project, and nobody was fired or quit. The start up culture of the project remained intact, and development was not impeded by the acquisition. In the first place, the developers moved to a new architecture seeking ways to support more users. Next, Producteev became free to attract critical mass of users and by now, more than 100,000 companies use its platform. Now, the company believes, more customers will be willing to subscribe to the Pro plan. The developmental team is now double its initial size, but delivers as often as it used to, and Jive provides a fruitful and thriving environment for co-operation. “We couldn’t have developed the Outlook integration without Jive,” confesses Abehassera. The paid plans will enable the project to generate more revenue for Jive legitimizing the Jive’s involvement in the work on this project. “In general, you won’t find anything more agile than a start up. We proved that we have become more agile, ever since we joined Jive,” said Producteev co-founder.